Cascades Pro Select toilet paper is soft and absorbent bath tissue that offers long-lasting quality and absorbency. These economical, moderately priced standard toilet paper rolls reduce maintenance time by cutting down on run-outs. Cascades Pro Select toilet tissue is great for use in restrooms, public facilities, schools, industrial settings, retail stores and quick-service restaurants. Each carton includes 96 individually wrapped rolls so you'll always have some on hand and your refills stay clean and dry while in storage. 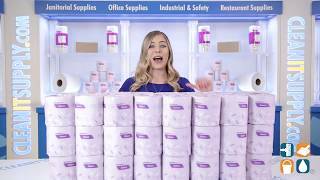 Order Cascades Pro Select 96 rolls of toilet paper today and save! Great deal. I try to mention it in every way I can. It's an excellent quality toilet tissue that we use here at home, primarily because it's safe for use in our septic system. It's also a great value for the money. We have a septic tank on our home so having a bath tissue that is septic safe is great. I set these up for auto delivery. Good product. Good price. Good shipping. Great product much better then other donations that we have had to use. Wish there was more to the roll. But it is still a great product. I bought these 2 cases of toilet paper to give one to the Food Pantry and one to the Homeless shelter. Soft and good bang for the buck! Only issue is it rolls too freely from the roll... one pull and half the roll could be coming off. Very small rolls. Softness is okay. Great toilet paper for a great price! Personal household use .Yes I will recommend to ours. the tissue appeared to be of good quality,I would actually use it myself. This is great toilet paper for anyone on a septic tank. I experimented with several, including *** single ply and this beat them all and is much softer.